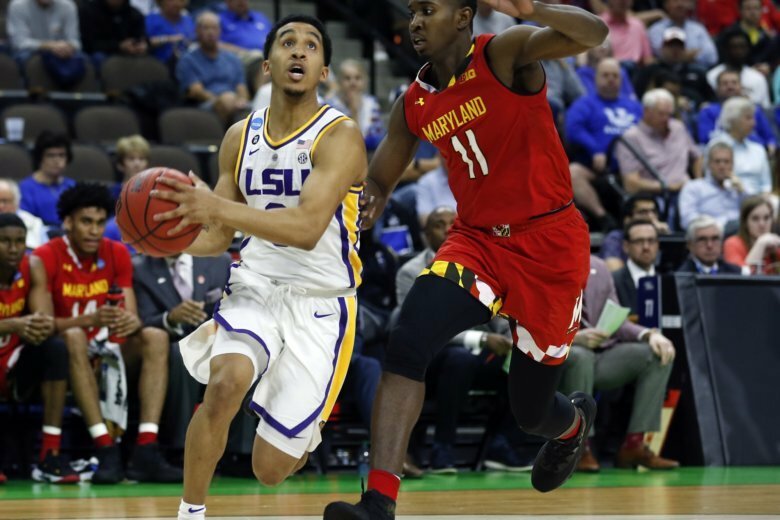 Maryland's second-half rally fell short against LSU, losing 69-67 in the second round of the NCAA Tournament on Tremont Waters' game-winning layup with under two seconds remaining. Maryland’s second-half rally fell short against LSU, losing 69-67 in the second round of the NCAA Tournament on Tremont Waters’ game-winning layup with under two seconds remaining. Eric Ayala got off a final shot from midcourt for the Terps, but it didn’t reach the rim. Maryland struggled in the first half, shooting just 26 percent from the floor and missed 13 of their 18 3-point attempts en route to a 9-point halftime deficit. After halftime, the Terps fell behind by as many as 15 points before staging a comeback. Jaylen Smith had a team-high 15 points and eight rebounds, including the game-tying 3-pointer before Waters’ layup. Bruno Fernando added 10 points and 15 rebounds for the Terps, who finish the season with a 23-11 record and fell just short of their first trip to the Sweet 16 since 2016. Suspended LSU coach Will Wade could only celebrate from afar. His team is headed to the Sweet 16 for the first time since 2006.